Well, school is starting up for a lot of people and everyone is getting back into their routines. We are going to have a kindergartener this year so I'm kinda freaking out about getting a routine down. We aren't nervous about school. Oh no! Lady H has been talking about it and asking me 18 times a day, "Do I go to school tomorrow?" She is actually going on Thursday. The elementary school she is going to attend is doing the kindergarten schedule in staggered days, meaning 5-6 kids go one day, another group goes on another day, and so forth. I think it's to off-set the overwhelmingness of starting school. She will start full-time on Monday. I have NO DOUBT Lady H will do just fine. Being an only child, she craves being around other kids and making friends. For the past five years, we've been blessed by the fact that my husband works from home and we didn't have to pay a dime for childcare. However, Lady H didn't have the much needed interaction with other children. But I can say that my husband deserves some kind of "father/husband/agent of the past five years award". So we know who is most excited about H starting school, right? LOL! I know it is going to take all of us a couple of weeks to get a routine down. I'm really hoping that we can all adjust and stay sane (and friendly). Hee-hee. I'm a huge believer that a good breakfast makes your day. 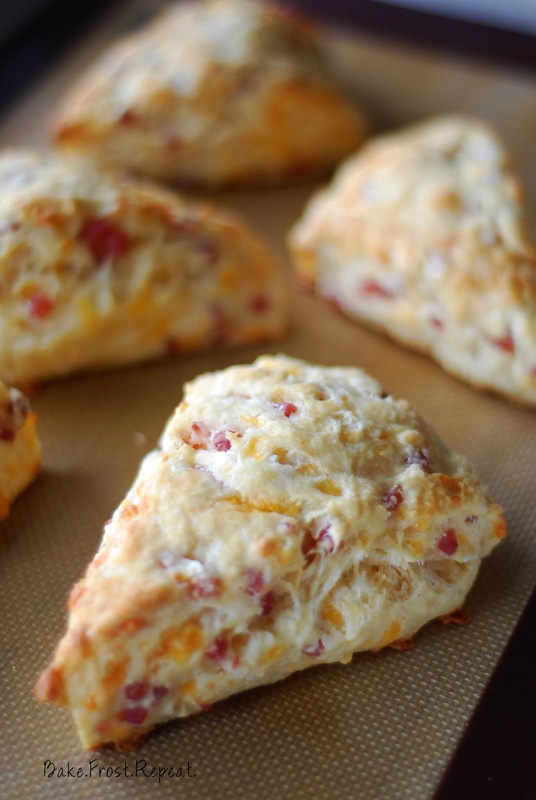 These ham & cheese scones are perfect for a busy morning when you need a quick, grab-n-go breakfast. Make them the night before and just heat them up the next morning. Happy Back to School everyone!! In a large mixing bowl, combine the flour, baking powder, sugar, and salt. Cut in the cold butter with a pastry blender or 2 forks until the mixture resembles coarse meal. Stir in the cheese and ham. Combine the buttermilk and egg whites, stirring with a whisk. Add to the flour mixture and stir until just moist. Turn out the dough onto a lightly floured surface and knead lightly 4-5 times with floured hands. Pat the dough into an 8-inch circle and cut into 8 wedges. Place on baking sheet lined with parchment paper or a silicone baking mat. Bake at 400 degrees for 20 minutes or until lightly browned. Great pic yo! I love savory scones, heck I love ALL scones, but I'd be so down with ham and cheese. Much luck on H's first day! She's going to love it! I think I like savory scones even more than sweet ones. These look delicious! I've never made savory scones, these sound great! I hope your little one had a great first day! These scones would make a perfect breakfast! Yum! Yes to starting the day with a good breakfast! I've always had sweet scones but I'd love to try this savory one!